Ministry of Propaganda - 19/Nov/2006: "Autumn Sunday Canal Walk"
When I stood up this morning my plan was to visit Westonbirt Arboretum today. During my morning run I looked at the trees along my route, thought that I have been before and that it was probably too late for this year. 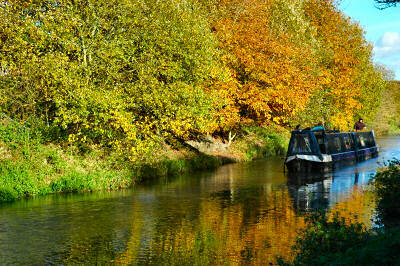 I decided that there were better ways to spend the £7:50 and opted for a walk along the Kennet & Avon Canal instead. Looking at the Ordnance Survey map for Marlborough and Savernake Forest (which covers most of the canal in a reasonable distance from Swindon) I thought the area around Horton near Devizes looked quite promising. There was also a pub, where I might be able to spend the £7:50 I wasn't paying to get into Westonbirt. I parked my car at the Bridge Inn (sorry, couldn't find a website) at Horton Bridge and after looking at their opening hours and the time decided to split my walking: First walk to Devizes and back, then have lunch and then go for another short walk around Horton. The walk to Devizes was very nice in the mild autumn lunchtime sun. Some of the trees along the canal still had a few leaves in their autumn colours on them, looking very nice with the passing canal boats. After just over an hour I arrived back at the pub, only to find out that I wasn't going to spend my £7:50 today. They were full for all food and I hadn't made a booking as it hadn't looked that busy when I had left. Another change in plan then. I left for the second part of the walk immediately (I had some muesli bars and an apple with me as 'emergency' food) and would have a pint later if I returned early enough. 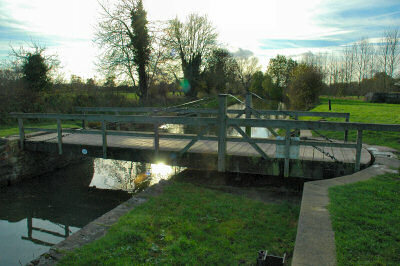 Soon I arrived at the swing-bridge crossing the canal between Bishops Cannings and Horton. I hadn't seen this type of bridge at the canal before, the bridge turns sideway to let boats pass through. There is a second bridge like it further down the canal, but that one isn't in use any more. I walked along the canal towpath until I was past Horton Farm, then left the canal to return along a footpath over some fields. 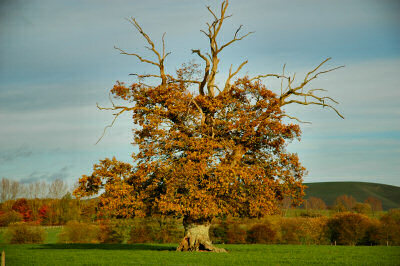 Here I had a nice view of a big old tree in its autumn colours and the mild afternoon light. I arrived back at my car (and therefore the pub) just before 15:00hrs, too late for a pint as the Bridge Inn closes for the afternoon. So I drove home instead for a nice cup of tea, chocolate biscuits and a hot chocolate. £7:50 saved for another time.